You will find the largest selection with the lowest prices on Wholesome Hide- Made in USA Certified rawhides. Stock up this winter and enjoy free shipping on your order of $75 or more. Whether your dog is a heavy duty chewer or a Maltese, you will find a size for your dog. We are proud to announce the new 5 pack of mini rolls- Just released. They are the perfect size retriever roll in an economical 5 pack for your small dog. 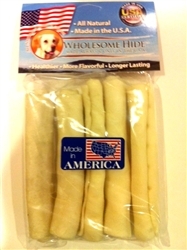 Buy our 10 pack of super thick retriever rolls and add one more and receive free shipping. If you don't know the difference between made in USA rawhides, you will be surprised. Those rawhides you pick up at the big box stores are not fresh. They have been processed and shipped in large containers and sat for a very long time. The Wholesome Hide rawhides are freshly processed and shipped immediately in refrigerated trucks to the Wholesome Hide processing facility in Illinois. They are then cut, shaped and dried and immediately packaged. These rawhides are the only made in USA certified, collagen rich bones that you will find. If you are tired of dried out, crispy and sharp rawhides, give these a try. They are definitely worth it. Our customers are repeat customers because we inspect each and every rawhide that we order. Unlike other stores, we take the time to make sure that you receive only the best for your pet. We are a small, family owned company that treats their customers just like family. or Call us 877-863-5431. We are always here to answer your call and questions.